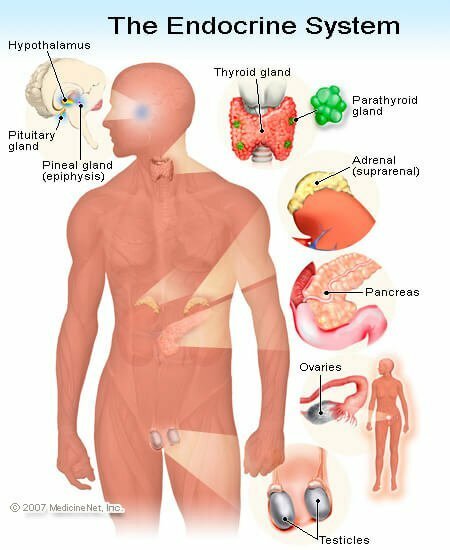 Endocrine gland: A gland that secretes a substance (a hormone) into the bloodstream. The endocrine glands are "glands of internal secretion." They include the hypothalamus, pituitary gland, pineal gland, thyroid, parathyroid glands, heart (which makes atrial-natriuretic peptide), the stomach and intestines, islets of Langerhans in the pancreas, the adrenal glands, the kidney (which makes renin, erythropoietin, and calcitriol), fat cells (which make leptin). the testes, the ovarian follicle (estrogens) and the corpus luteum in the ovary).